범어사 대웅전 앞에 있는 석탑으로, 2단의 기단(基壇) 위에 3층의 탑신(塔身)을 세운 모습이다. 이 탑의 특징은 탑의 받침대 역할을 하는 기단에서 찾을 수 있는데, 위·아래층 기단의 옆면을 기둥 모양으로 장식하지 않고 대신 안상(眼象)을 큼직하게 조각한 것이다. 탑신부는 1층 몸돌에 비해 2층 이상은 급격히 줄어들고 있다. 평평하고 얇은 지붕돌은 처마가 수평을 이루며, 밑면의 받침이 4단으로 되어 있어 통일신라 후기의 양식을 보여준다. 꼭대기에는 머리장식을 받치던 네모난 받침돌 위에 보주(寶珠:연꽃봉오리 모양의 장식)만 남아 있을 뿐 다른 것은 없어졌다. 통일신라 흥덕왕(재위 826∼836) 때에 세운 탑으로, 일제시대에 크게 수리를 할 때 기단 아래부분에 돌 하나를 첨가하는 바람에 기단부가 너무 크고 높은 느낌을 준다. 밑에 둘러진 난간도 이때 만들어졌다고 한다. 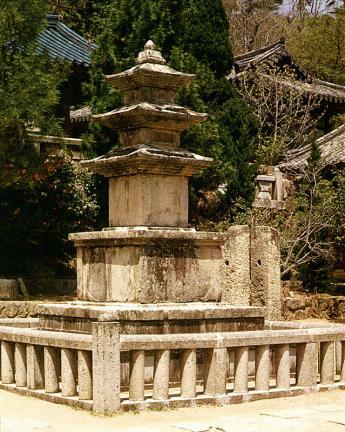 This pagoda located in front of Daeungjeon Hall, the main hall of the Beomeosa Temple, is believed to have been built during the reign of King Heungdeok (826-836) of the Silla Dynasty. 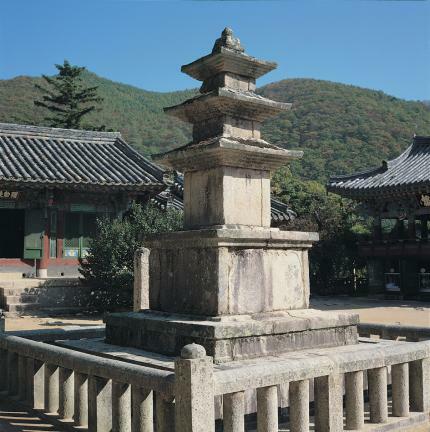 This three-story on a double-foundation stone pagoda follows the general style of stonework of Silla Period. It is decorated with the "panel design" rather than the usual pillar-shaped carvings. The second and third stories are disproportionately small compared to the first story. 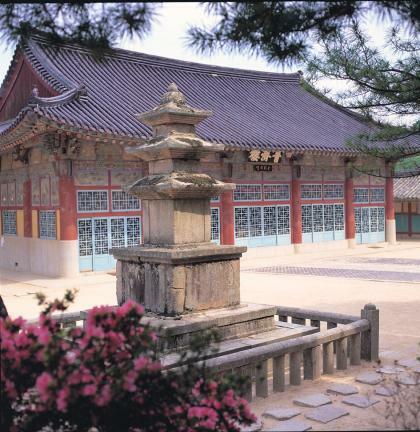 The roofs rest on rather flat, thin four-tiered cornices and the eaves are horizontal reflecting the unique style of late Silla masonry. 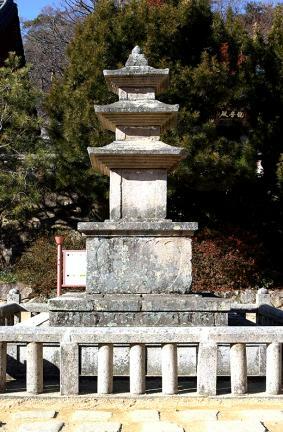 The only remaining parts of the pagoda's finial are the lowest part of the ornament, although the pearl-shaped sacred jewel was added later. 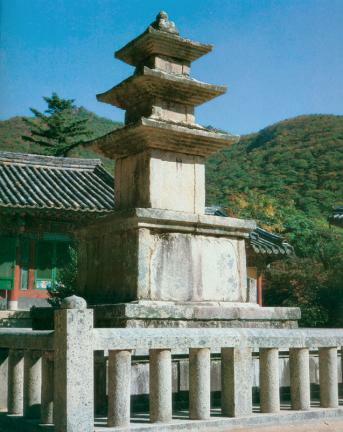 During the repair work executed during the Japanese occupation of Korea, the base part was repaired to be too tall and large. A railing was also provided at the time.